LG on Thursday formally announced its next-generation LG gram ultra-thin notebooks. The new laptops will be as sleek as their predecessors, but will get a more durable chassis, Intel’s latest quad-core 8th generation Core i5/i7 processors, optional Thundebolt 3 connectivity and a higher-capacity accumulator that enables 19 – 22.5 hours battery life. The new LG gram 2018 notebooks will continue to be offered with 13.3”, 14”, and 15.6” display panels with optional touch support. LG does not disclose resolution, but it looks like it is going to remain at 1920×1080 pixels, unchanged from the current-generation LG gram and standard for laptops with an ultra-long battery life. The upcoming LG gram PCs will come in a new Carbon Magnesium alloy chassis that visually resembles the current-gen LG gram notebooks, but has one important difference. LG moved the webcam along with a light sensor and microphones from the bottom of the display bezel to its top (where they should be). The display hinge remains the same, just like the overall look of the chassis: smooth rounded edges and no sharp corners. Meanwhile, LG used a new alloy for the chassis and also redesigned internals of its gram laptops to make them more rugged and durable to survive improper handling and unfriendly environments. The manufacturer says that its 2018 LG gram notebooks have passed U.S. military MIL-STD 810G durability tests for resistance to impact, pressure and temperature, but does not elaborate. Back in the past LG’s Gram PCs were criticized for being too fragile, so the new systems apparently address this drawback. 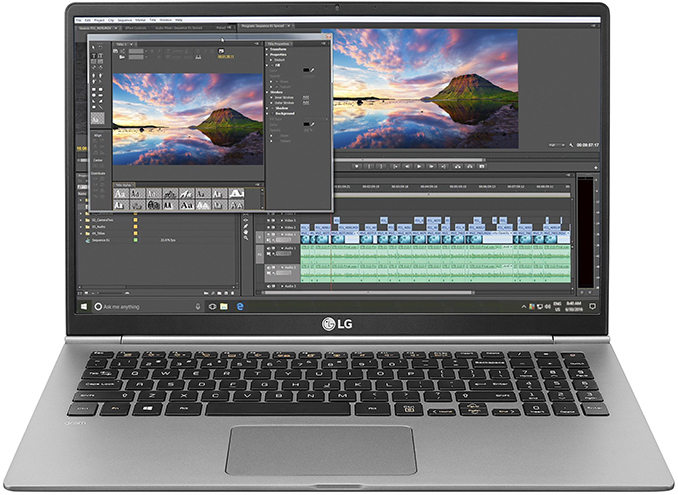 LG does not share all technical specifications of its next-gen gram laptops, but only says they are based on Intel’s 8th generation Core i5/i7 processors that have four cores and therefore offer better performance than predecessors in applications that can take advantage of additional parallelism. Beyond CPU specs, we know almost nothing. It is logical to expect that some variants of the systems will feature 8 GB of memory, others will be outfitted with 16 GB, but larger options remain to be seen. When it comes to storage, the new systems will come equipped with SSDs of regular capacities you expect from modern notebooks (256 GB – 512 GB), but will also feature an additional M.2 slot for an extra drive. As for connectivity, the notebooks will also feature an 802.11ac Wi-Fi + BT module, two USB 3.0 Type-A headers, a USB Type-C connector that can serve either as a Thunderbolt 3 port, or a USB 3.0 port (depending on the SKU), an HDMI output and a mini-jack for headphones. Another key improvement of the next-gen LG gram laptops over predecessors will be a new battery featuring 72 Wh capacity that enables 19 – 22.5 hours of battery life (based on MobileMark 2014 criteria) depending on the model. It is unknown whether LG tailored its systems to run longer by using more energy efficient components (e.g., LPDRR3 instead of DDR4, etc.) and tweaking settings, but this is something we are going to learn in the future. In any case, the new LG gram laptops might be not only one of the most compact mobile PCs around, but also among the longest-lasting ones. LG plans to start selling its 2018 gram laptops sometimes next month in the U.S. Pricing is not announced at this time.